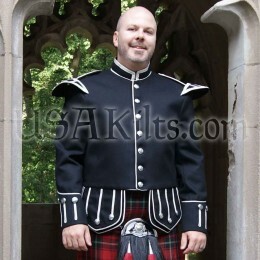 USA Kilts has you covered with kilt jackets for all occasions. 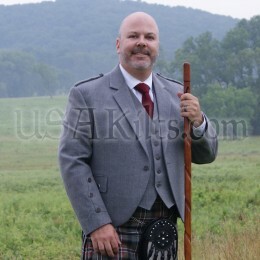 Highland wear includes many kilt jacket types which span the full range of needs; from tweed day wear to formal kilt jackets. 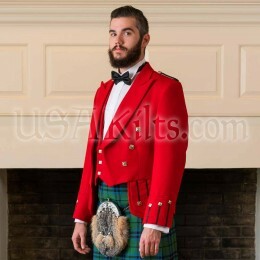 We make it easy to find the look you want, whether it is “timeless traditional” or “sleek contemporary.” Each jacket or vest you order from USA Kilts is made in Scotland. 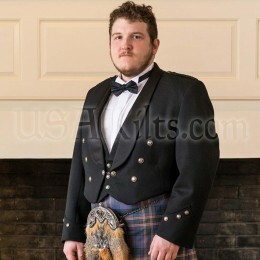 What is the most formal kilt jacket? Participating in a wedding, black-tie or white-tie event? Consider the elegant Prince Charlie jacket and vest. A Prince Charlie jacket is easy to recognize with its traditional silver buttons, cutaway style and satin collar. It never goes out of fashion. 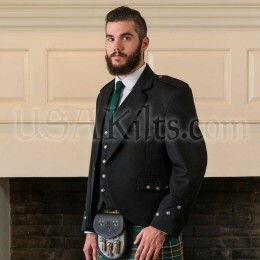 Is there an Irish kilt jacket option? More than one! 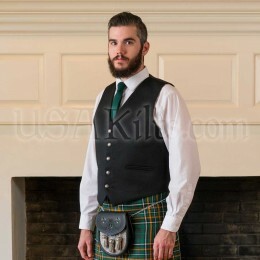 For a kilt jacket and vest that clearly says “Ireland”, we offer two options -- the Kilkenny and the Brian Boru. The Kilkenny jacket and vest is equivalent to the Argyll set, but feature different details and Irish harp pewter buttons. The Brian Boru jacket is the Irish version of a prince charlie -- elegant and dashing. What is the most popular kilt jacket? The classic Argyll jacket and vest is an all-purpose set-up. Good for a semi-formal to formal suit look. 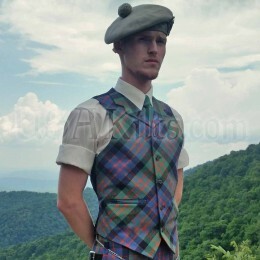 You can wear the Argyle kilt jacket by itself, or wear the argyll vest by itself. If you want something that has a more urban contemporary look, the Wallace jacket and vest is for you. Our Wallace jacket is a dignified herringbone, three-button design, but without the silver buttons of an ordinary kilt jacket. Use it as a casual kilt jacket or dress it up for the evening! 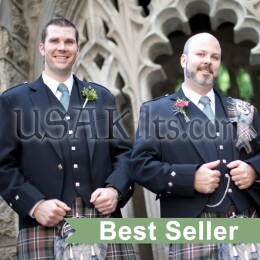 Is there a kilt jacket for bagpipers? Yes! Check out our special Piper Flex Argyll Jacket. 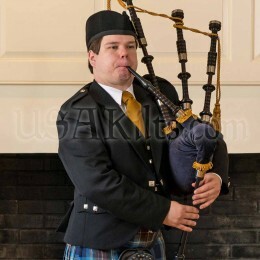 We also provide superior quality piper’s doublets. 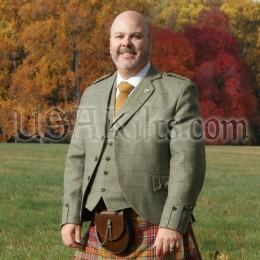 How do I choose the right tweed jacket to go with my kilt? As with kilt hose, the best thing to do when selecting a tweed kilt jacket is to choose a color that tones well with your tartan. 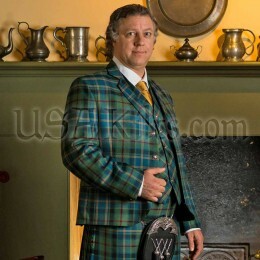 For instance, if you wear the US Navy tartan, then a blue tweed kilt jacket may be perfect. There are many color shades and tweed patterns to choose from so you can fully customize your look! If you can’t decide on a color, consider a subdued grey argyle kilt jacket such as our ‘Braemar Jacket’. 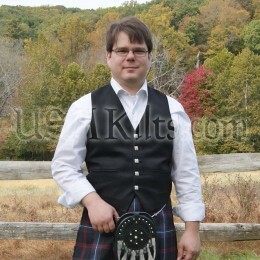 It can serve as a casual kilt jacket for many events and is a good stand-in for a tweed kilt jacket in warmer weather.